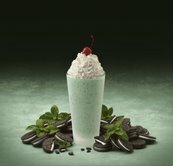 Chick-fil-a will be introducing a new hand-spun Mint Cookies and Cream Milkshake starting on St. Patrick's Day (March 17). It will be available through June 30th. The new shake includes Oreo cookies and mint flavoring and will be available in a 20 oz. cup and priced at $2.79. Chick-fil-a's Cookies and Cream Milkshake has 790 calories, 300 calories from fat, 33g total fat, 18g saturated fat, .5g trans fat 95mg cholesterol, 660mg sodium, 111g carbohydrates, 1g fiber, and 100g sugars.